Today we have the portable Honeywell air purifier, some gaming titles, laptop and more gadgets, which can be purchased at a lowered price. There comes a time when you are running low on funds, but still the techie inside you wants to buy a gadget or a game which will keep them engaged and entertained until funds arrive. 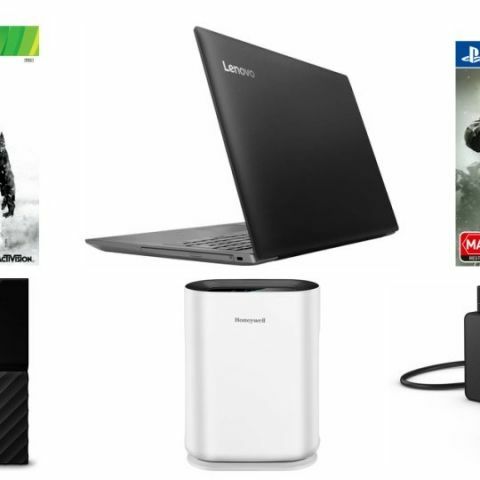 Today we have listed a laptop, a couple of gaming titles, a smartphone, storage solution and some more gadgets, which you might’ve wanted to buy at lowered prices at one place, so that you don’t have to go scrounging the internet for them. The Sony SBh-24 earphones sport Bluetooth connectivity and one can use any headphones with it. It comes with a mic to handle calls as well and can be instantly connected via NFC. You can buy it here. The Asus monitor is a 27-inch LED monitor, which boasts of 1ms response time and features a full HD resolution of 1920x1080. You can buy the device here. The 1TB external hard disk is USB 3.0 enabled and comes with a 2.5-inch form factor. It can be set-up to perform routine auto backups with the included WD backup software and supports password protection with hardware encryption. You can buy it here. The 6th Gen Core i3 powered Lenovo laptop features a 15.6-inch display and comes with 4GB DDR4 RAM with a 1TB HDD. It features on USB Type C port, two USB 3.0 port, and one HDMI port, along with two 1.5W speakers. You can buy the laptop here. The Honeywell air purifier features a HEPA filter with activated carbon and can cover up to 323 sq ft area while consuming 53W power. It comes with touch controls and can be operated in three speed settings. You can buy the device here. The Call of Duty: Infinite Warfare is a first person shooter based on military tact and it features many modes to select from. It has campaign, multiplayer and zombies mode. You can buy it here. This is one of the classic title from the Call of Duty franchise with an intense single-player campaign mode which pushes the player in a soldier’s shoes in the events of World War 3. You can buy it here. The Canon EOS 1300D is being offered with a free camera bag and a 16GB SD card. It is equipped with a 18-55mm ISII Lens is an 18MP DSLR. you can purchase it from here. The smartphone is powered by a Snapdragon 435 processor with 3GB RAM and 32GB internal memory. It comes with a 13MP rear camera and a 5MP front facing camera. You can buy it here.